According to a four-decade study recently published in The Lancet, “Trends in adult body-mass index in 200 countries from 1975 to 2014: a pooled analysis of 1698 population-based measurement studies with 19·2 million participants”, there are 266 million obese men and 375 million obese women in the world as of 2014. These numbers, based on estimates in BMI changes from 186 of 200 countries in the world (99% of the world population), are exceptionally high compared to those recorded in 1975: 34 million men and 71 million women. In the world’s poorest regions such as south Asia, however, populations remain underweight. Nonetheless, global obesity is expected to reach 18% of the male population and 21% of the female population by 2025. 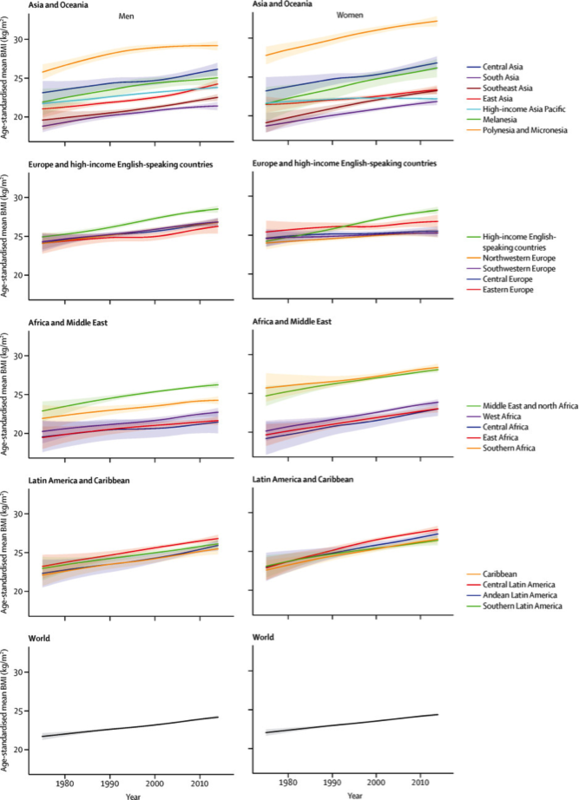 According to the study, the largest increase in average BMI occurred in high-income English speaking countries for men and in central Latin America for women. In most areas in the world, more people are obese than underweight. Whether or not we can blame this on fast food places like McDonald’s is beyond my knowledge, but the study does mention that the dangers of being underweight may be just as bad as those of being obese. Being underweight can lead to an increased risk of mortality in diseases like tuberculosis and increases risks in pregnant women and newborn babies. Perhaps our fattening fast food is an evolutionary boost in disguise. However, if you don’t reside in south Asia, watch out. You could very well become the next statistic. Ever had the munchies? Rumor has it that you can get them without consuming marijuana via sleep deprivation. If you’re trying not to gain weight, you may want to consider your poor sleeping habits. After a poor night’s sleep, your body is more likely to crave sweet, salty, and high-fat snack food, and more of it, too. What we call the “munchies” actually comes from a chemical response to marijuana on the brain. Marijuana throws off the balance of the endocannabinoid system and its signals (such asendocannabinoid 2-arachidonoylglycerol, or 2-AG), but so can your body’s lack of sleep. 2-AG levels seem to rise when your body is sleep deprived, causing you to be hungrier than usual. In other words, the combination of marijuana with a lack of sleep can be extremely counterproductive to anyone seeking to lose weight or even maintain it. A new study conducted by Erin Hanlon further indicates that sleep-restricted subjects showed 2-AG levels up to 33% higher than non sleep-restricted subjects. These subjects are also seen to choose snacks that contain 50% more calories than those than non sleep-restricted subjects choose. A sleep-deprived body may also simply be craving more energy, since it doesn’t have much as a result of its lack of sleep. Sleep-deprivation’s effects mimic those of the “munchies” that marijuana can give you. Rethink your sleeping habits if you’d like to snack less, and be aware on how poor sleeping habits can influence your body as much as a drug. An article from Independent (“Healthy Food Doesn’t Exist – According to Experts”) argues that healthy food really doesn’t exist. The fat in fat-free half-and-half has been replaced with corn syrup. Pork cracklings are assumed to be bad because of their fat when they really can be beneficial because they are high in protein. Shoppers are constantly left confused because they look for what is “healthy” rather than what is nutritious. According to the San Francisco Chronicle, avocados are the way to go. They are versatile and do not contain sugar, dairy, or gluten. According to Independent, Freekeh is the new thing. “Throw out your quinoa”, they say, because freekeh is a trending grain that’s low in fat and high in protein, iron, and fiber, leaving you full and energetic. Independent also recommends eggs, goat milk, fish, sweet potatoes, wild greens and herbs, tofu, walnuts, black beans, fresh fruit, seaweed, wild rice, garlic, prawns, and chillies, as “superfoods” that can help you live longer. If you ask me, I’ll eat whatever looks appetizing and won’t kill me (kidding, a little). It’s hard to know how to shop for healthy foods today, but it seems that it’s always better to choose natural foods over processed foods or those that contain too many chemicals. It’s important to understand what nutrients and chemicals may be in your food and to choose “healthy” wisely.